Protocol – A set of instructions or rules or guidelines that are used in establishing communications between computers of a network is called as Protocol. Gateway – A device on a network that serves as an entrance/exit to another network and routes traffic across networks. LAN – Local Area Network. 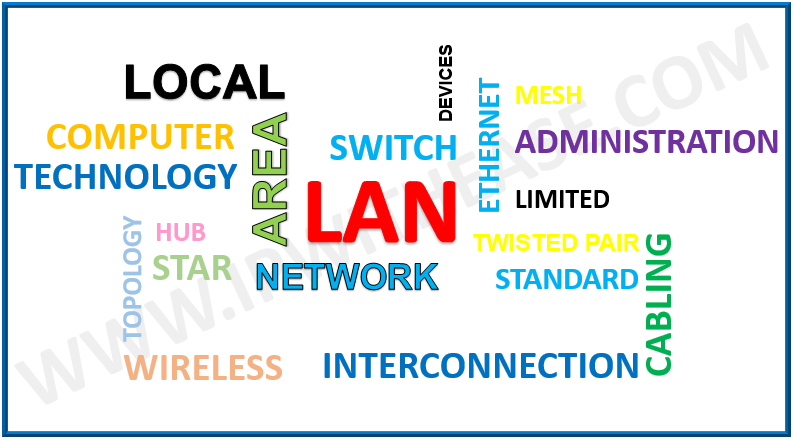 LAN may be referred to as entire network or a logical segment of the network. A LAN is the intranet of a business or home network local to the connected network devices. Routing protocol – The set of rules of the router configuration used to choose the best path toward the destination network logical address. The routing protocol creates a routing table within the router to be used for path determination. Examples of Routing protocols are RIP,EIGRP,OSPF and BGP. MAC address (Hardware Address) – A unique address associated with a particular network device. The MAC address is used by the Media Access Control sub layer of the Data-Link Layer (DLC) of telecommunication protocols. The MAC address is sometimes referred to as a networking hardware address, the burned-in address (BIA), or the physical address. Switch – A network switch is a networking device that connects devices together on a computer network by using packet switching to receive, process, and forward data to the destination device. A network switch can also be called as a multiport network bridge. Bandwidth – Indicates the amount of data that can be sent in a time period. Measured in Mbps which is one million bits per second. PING (Packet Internet Groper) – A command used to test connectivity to a device over a TCP/IP network. TCP/IP – Transmission Control Protocol/Internet Protocol. A suite of protocols used as the basis of the nation’s internetwork (Internet). It can also be used on internal networks. WAN (wide area network) – A network linking together networks located in other geographic areas. IP Address – Internet Protocol Address. Every device, when connected to a network, is assigned an IP Address. This allows your device to communicate with other devices and available network resources. Think of this as your cell’s phone number, allowing you to receive and make calls, send text messages, and access other services. DNS – Domain Name Service. DNS provides a means to attach a name to an IP Address making it easier to request resources. For eg – We use yahoo.com as DNS entry instead of remembering its IP = 72.30.35.9 , hence the headache of remembering IP addressing is not there. The concept of DNS is similar to that of your Contacts List on mobile phone. Its much easier to remember names than to remember their phone number. Network Interface Card (NIC) – A hardware device inside a computer or other network device that enables communication with a network. Bandwidth – Capacity of a given network media or protocol. The amount of data that can be transmitted in a fixed amount of time. Firewall – A firewall is a network security device or software solution which monitors and controls incoming and outgoing network traffic based on predetermined security rules. A firewall enforces a set of rules about what data packets will be allowed to enter or leave a network. A firewalls primary responsibility is to establish a barrier/checkpoint between a trusted internal network and untrusted external network, such as the Internet. VPN –Virtual Private Network. VPN is a means of joining two networks together, when they aren’t physically together. VPN technology that creates a safe and encrypted connection over a unsecure network like internet. VPN was developed to allow remote Internet users to securely access corporate applications and other resources from home or when outside the corporate network. Bit – A unit of information having just two possible values, as either of the binary digits 0 or 1. OSI Model – OSI stands for Open Systems Interconnect. OSI is the reference model which defines how applications can communicate with each other over a networking system. Port – When an application wants to send or receive traffic, it has to use a numbered port between 1 to 65535. This is how you can have multiple applications on a computer using the network and each application knows which traffic is for it. URL – Uniform Resource Locator. It is also known as a web address also. URL is a method of identifying the location of a file over internet. In other words, a URL is the identification for any resource connected to the web globally like Web Pages and images etc. TCP – TCP stands for transmission control protocol. It is implemented in the transport layer of the IP/TCP model and is used to establish reliable connections. TCp protocol is used over the internet, including WWW, FTP, SSH, and email. UDP– UDP stands for user datagram protocol. It is a popular companion protocol to TCP and is also implemented in the transport layer. UDP offers unreliable data transfer. UDP is ideal for VOIP, games, and other applications which are sensitive to delays.